Final Fantasy VII: Finally Finished! Well it’s finished. After seven years of trying to get through the game only to be distracted away from it time and again, it’s finally done. I’ve finally beaten Final Fantasy VII! It took over 45 hours spread over a month of dedicating normal play hours (as well as sneaking in time whenever I could find it), but it’s finally done…and It was totally worth it! A funny thing that came out of this was the realization that I come pretty darn close not two attempts prior! I’ve gotten to disk 3 before but didn’t realize that the only thing left was the final dungeon and the showdown with Sephiroth. To have come so close to the end only to leave it hanging there…the gamer in me just cringes at the thought of such sloppiness! I can’t believe I was so close! Anyway, quite a bit happened after the last update. Something about once again making it to disk 2 created a burning desire to discover everything this game had to offer! My stalwart group of heroes found the sunken Gelnika, braved the ancient forest, won the OmniSlash, faced the “challenges” of Wutai, and mastered the secret art of chocobo breeding to eventually claim the fabled Knights of the Round summon! Not to mention getting the main party’s final limit breaks and ultimate weapons. Without all this the game could have been finished so much more quickly, but with all the story and character building to be found in these sidequests, I don’t think the game would feel anywhere near the same if done without it. 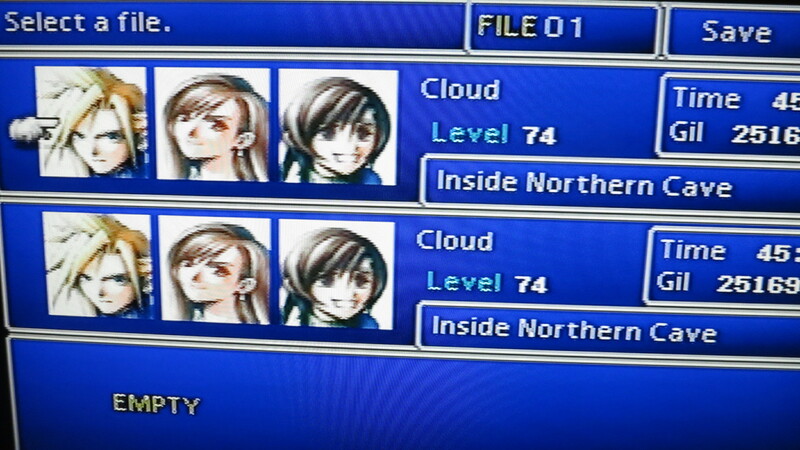 Cloud, Tifa, and Yuffie FTW!!! All this optional, and at times secret, content is really a credit to the game and its makers, especially in this modern gaming landscape of hand-holding players past everything significant in a game. Maybe it’s nostalgia talking, but how many games these days just leave it up to us players to go out and discover the best bits? Not many. Come to think of it, maybe that’s why Skyrim was so refreshing. Everything in that game was found by just going out and poking around, what other recent game has done that? Anyway, about that Sephiroth fight…what was up with that? First there’s…this thing (pictured above). Don’t get me wrong, it was an epic fight, and the party switching mechanic made me wish I’d spent more time with the rest of my characters, but I’m with the Duck on this one. What is the deal with Bizarro Sephiroth? Is it supposed to be his ultimate demonic form? A fusion of all the evil elements he could find in the Lifestream? A fun fight, but definitely a weird one. WHAT IS THIS SUPPOSED TO BE?! While were at it, let’s not forget Safer.Sephiroth. He’s got the coolest music in the game, the scariest attacks, and easily the most bizarre appearance. 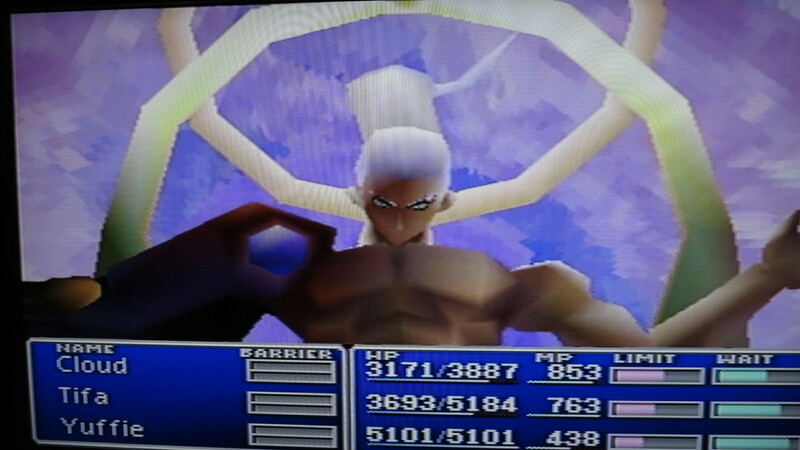 I’m thinking this is supposed to be how Sephiroth sees himself: an all-powerful god-like being. Something oddly majestic yet unspeakably terrible in its power and intent. It was an excellent fight, but I couldn’t help but feel like it was easier than it should have been…ah well. 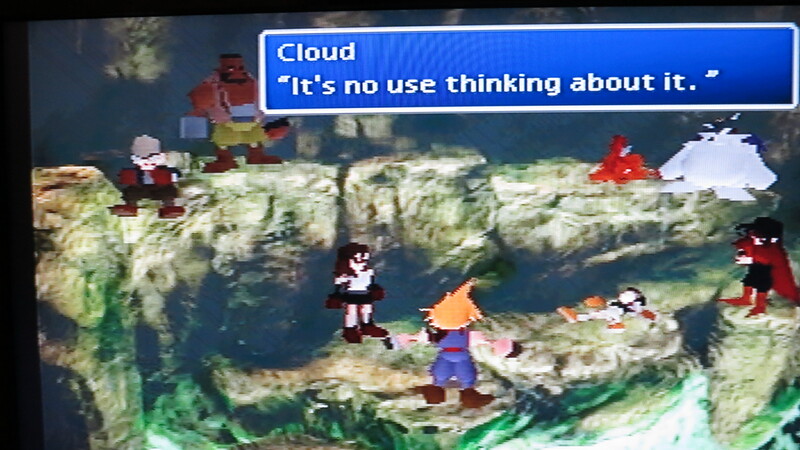 You got the right idea there, Cloud. In all, it’s surprising how well this game measures up to its modern-day counterparts. Even surpassing some of them to one degree or another (I’m looking at you Final Fantasy XIII!). It’s much easier to understand why so many want to see an HD remake of this game. I wouldn’t mind it too, but I wonder if this really a game an HD remake would be able to do justice to. It has such a unique look and so many fun little quirks to its gameplay that I just don’t see a remake being able to capture it effectively. Guess we’ll just have to wait and see what happens if they actually end up doing it. What did you think of those final fights? Do you think a remake would be able to do FFVII justice? How do you move on from achieving a gaming goal? Congratulations on finishing! 😀 FFVII is definitely worth playing through. I have to say that I am eagerly hoping for a remake of this game. I think it would do it justice if they pay attention to the story line and really work to capture the emotions and feel of each scene. They can’t simply slap better graphics on and call it a day. This is mostly because well.. they didn’t exactly have true faces in the game, and so facial expressions were.. you get the point. I also hope for a remaster of FFIX, which is my favorite FF game. Have you played it? Thanks Britney! You do have a point there, actually giving the characters faces during the big scenes would make a huge difference, but I just wonder what a proper translation would need to look like. For example, I would want them too keep a form of the fixed camera and pre-rendered look of the backdrops since they’re so important to the game’s identity, but would that be a realistic expectation for a modern remake? Also, I haven’t played FFIX. I actually don’t know anything about it, since it’s not as widely talked about as many of the others. What’s it about? I imagine that would be a pick and choose situation. They would need to figure out when it would be ok to pan into the scene and when they’d need to keep the camera fixed to maintain the game’s identity. Good point! FFIX for me felt more like an old school Final Fantasy. It sort of went back to more of a medieval/magic type feel rather than moving into mecha like FFVII and FFVIII did. Airships included, of course. Still, the thing that got me with FFIX is the personal journey and growth that almost every character goes through in the game. It’s a group focus instead of having a primary focus on one or two characters. They change and evolve like a character should, as does their relationships with each other. Also, the story is serious without taking itself too seriously. There are plenty of moments of respite from hectic moments. The gameplay is ridiculously fun, battles are challenging, and there are some facts that will throw you for some serious loops. It’s a tad quirky at moments, but that’s what set it apart. But, I won’t spoil it for you. Let me just say that if you like Final Fantasy, it’s one you should definitely play! ..And now I want to play it. Lol. Great. Congrats on completing the game. You did it! 🙂 I love the feeling of finishing a game and being able to leave it on your shelf until the urge to play again overcomes you. Even better than finishing the game is the feeling of having enjoyed the journey you went on with these characters. Thanks Simpleek! You’re right, the best part of the game is the journey rather than the destination, but even though it’s disappointing to have it finally end, I suppose it’s what makes that journey worthwhile. Great job! 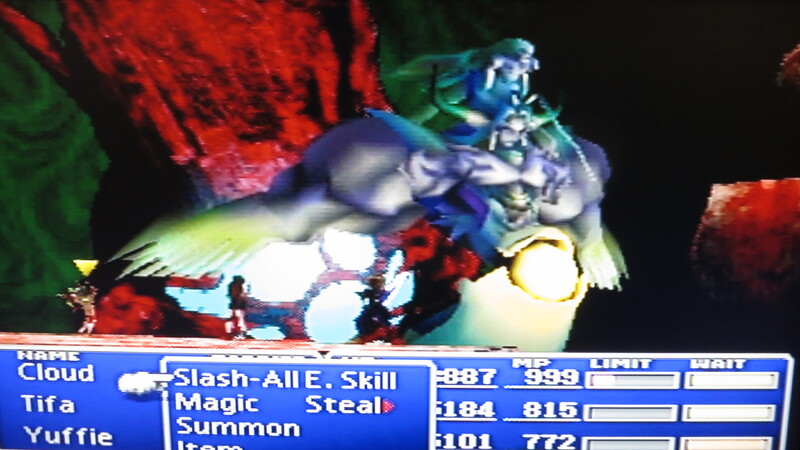 Yeah, those final bosses were weird, and what does the name Safer Sephiroth even mean? No idea. I hated fighting him. That Super Nova attack was absolutely absurd. And I was so stressed during the battle, I didn’t even hear One-Winged Angel. I was so looking forward to hearing the original version, then once the game was beaten, I realized, I somehow missed the whole thing. Stress-induced deafness, apparently. But, there was no way I was sitting through ten Super Novas, only to die in the end. It wasn’t happening. Thus, the anxiety. Anyway, I used to want an HD remake of this game, and now I don’t. It’s perfect as it is. Part of the charm is those terrible, chunky graphics it has. Just like how I dislike the Android version of FF6. They changed what the characters look like, and while they do look better, I want the original version. The original, for me, is always better. So what are you going to work on beating now? I guess a new goal you could make is getting 100% in something or beating hard mode. Those are goals I usually make. Thanks Duck! I suppose only the Square writers will ever really know what “Safer” Sephiroth means. You know after fighting him in FFVII, I’ve gained a new perspective on his Kingdom Hearts fights, in that they’re too…easy. They were difficult fights to be sure, both un-winnable without a certain skill active, but I kind feel like Sora should not have been able to defeat Sephiroth, an enemy with overwhelming power. Now that I think about it, both times he simply fades away with a smile, as if he had merely been toying with Sora for the duration of the fight and just decided to leave after he’d had his fun…chilling! I’m curious, do you remember what your average level was when you fought him? I’ve been told he gets more powerful if you have level 99 characters in your party. I got 100% in “Metroid Prime”, but never the second game. That one was hard. I’ll need to get 100% in my next playthrough, though. Last time, I just wanted to win with any percentage at all. So hard… And I thought the first game was hard. I freaking love FFVII! Congrats! How I viewed the life stream was a combination of how the party sees Sephiroth’s (bizarro) and how he himself sees himself (safer). I don’t think those two fights are either real or fake. They take place in an area that defies logic. JENOVA was the last physically real boss. And Sephiroth at the end was the barest parts of Sephiroth and Cloud, or just Cloud’s lingering resentment. It’s hard to wrap your head around what happened in those last battles isn’t it. Taking place in an unreality makes sense since it would explain how the rest of the group ended up down there, and how they somehow went from dark depths to a facsimile of a “heavenly” realm. Not to mention how any of Sephiroth’s attacks didn’t destroy the entire planet. 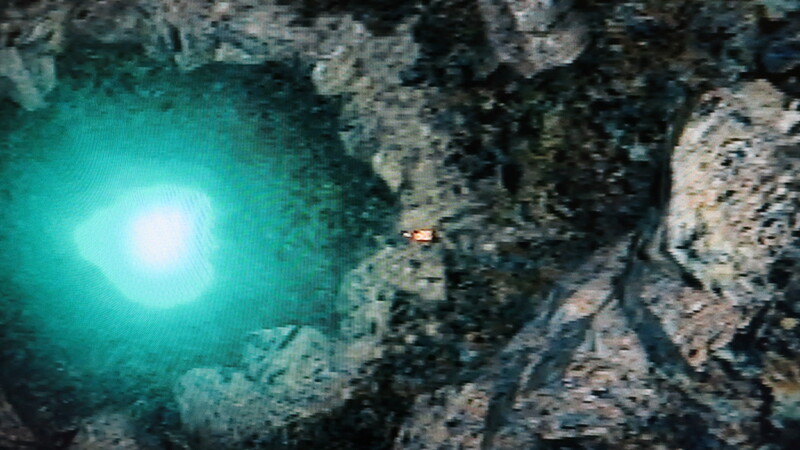 Seriously, if Supernova could affect reality, they would need to worry about Meteor would they? I think that last fight was Sephiroth trying one last time to exert some sort of will over Cloud, it didn’t work but it didn’t destroy Sephiroth either, he is still somehow a poisonous presence in the LifeStream, maybe he always will be. Yeah. It’s a very cliche “JRPG” boss fight if take it at face value, but if you look deeper than that, then things make a bit more sense. On a related issue, I suppose you went and got Vincent and Chaos right? When you really think about it, Hojo is the true mastermind behind everything, and Lucretia is his dim witted accomplice. Like, seriously, a lot of fighting and Sephiroth’s madness would have been prevented if Lucretia had done more to let him know that he’s her child. I mean, the JENOVA cells made her immortal. I’m sure she could figure out how to contact him somehow. Though I think Hojo deserves more blame than Lucretia. He brought all of this about just to see what would happen, he didn’t even do it for the science! Also just pointing out that Sephiroth is legitimately batshit crazy. Not even joking. So his mind is also affecting the life stream. Woohoo, congratulations! Isn’t it a gross feeling when you realize just how little is left in a game that you’ve never finished! I’ve been stuck on Jenova Synthesis for the absolute longest time, and that’s right before Sephiroth! I’m curious to know what strategy you used in the Jenova battle. Finally, my first move at the start of the battle was to cast Big Guard. After that, between the limit breaks (tifa had one too) and large amounts of physical damage to all parts of Jenova each turn, the battle was over fairly quickly, it was just a matter of making sure to keep the party’s health and Big Guard up. This actually worked pretty well against sephiroth too.